Scooper - Technology News: Is technology making us less productive? Technology might actually be killing productivity according to a new study – and an old piece of wisdom called Metcalfe’s Law. A team at Bain & Company analysed data on how people are spending their time at work. By combining this with productive output and total headcounts, they were able to see the impact of technology at work. Why is technology slowing us down? 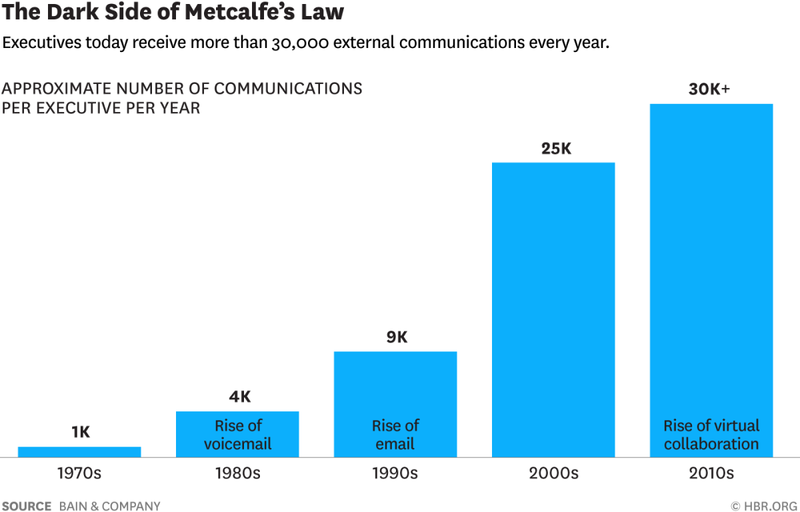 Tech pioneer Robert Metcalfe predicted that the value of a network increases with the square of the number of users. However, his law has a downside as well. As the costs come down, the number of interactions rises exponentially. All of these interactions take time. Consider the situation 30 years ago. If a manager was away from their desk, they’d get a note saying they missed a call – perhaps 1,000 a year. This then become a voicemail – perhaps 4,000 a year. Now, with the vast array of communication possibilities (email, Skype, instant messengers, phone) this has expanded to 30,000 communications. This is equally true of meetings. Setting up meetings before digital calendars was a far more complex task. Now, data suggests that 15% of a business’s collective time is spent in meetings. A percentage that has increased every year since 2008. All of this points to technology actually being a drain on productivity, rather than aiding it. Bain & Company’s research backs this up. Assuming a 47-hour working week, a typical supervisor or mid-level manager was estimated to have less than seven hours a week of uninterrupted work time. How is this even possible? Well, the analysis saw an average manager devote 21 hours a week to meetings and 11 to sending, replying to and reading email. Finally, another major chunk of time is lost either side of meetings and emails as we focus our attention. All of this combines to cut uninterrupted time to less than seven hours a week. Daily tasks are also taking longer. According to a recent study , 60% of workers have to consult, every day, with a minimum of 10 other employees, just to do their job. The same study also suggests that over the last five years, the time taken to accomplish tasks has skyrocketed. Recruitment takes 20 days longer than it did in 2010, while the time taken to complete an office IT project grew by over a month between 2010 and 2015. Mankins suggests two steps to make sure technology is working for your business, and not against it. First, organizations should consider whether the technology will save people time. If it only reduces cost, then it should be viewed “sceptically”. Second, businesses should look at their own behaviours, rather than the seemingly easy fix of technology. “Many investments in new technology are essentially workarounds for bad behaviours or poor procedures for sharing information,” argues Mankins. Greater consideration of the impact of technology on the workplace, and particularly productivity, could have a positive impact on business. It could well see new investments in technology rejected, he concludes.